We have put together "Quick Link Buttons" to try to make all of our lives a little easier. We want to make sure everyone is in the k"now" so no one is confused and every effort to keep all of the members of EVGBC up to speed is being utilized. 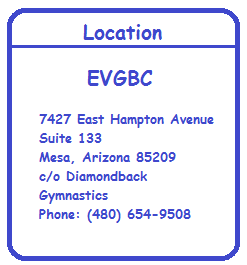 The first buttons will give you the power to get the information you need to keep up to date with your Gymnast. The second set of buttons is your first step in getting information you may have missed or need to feel more confident for a meet and upcoming events. Before asking the front desk or any other officer ask your Liaison. The button of your levels liaison is linked to their email address, so all you have to do is click on it and it will bring it up for you. Please allow adequate time for a response. Remember everyone here is a volunteer and have children attending competitions too. Be polite and respectful as it is just as stressful for them as it is for everyone else. The next set of buttons are for the business end of the Booster Club. These are set up in the same way as the buttons above. They will open another window for you to compose an email. Please allow adequate time for a response from the Officers.